If using whole almonds, roughly chop them. Toast the almonds in a dry frying pan until fragrant and golden (careful not to burn them). Remove them from the pan and set aside. Roughly chop the mushrooms (about 3/4" cubes). Thinly slice the zucchini. Heat some oil in the frying pan and fry the mushrooms and zucchini with the garlic until the zucchini is transluscent and the mushrooms have released their juice (5-10 minutes). Put the mushroom/zucchini mixture in a blender, along with the rest of the ingredients except almonds. Blend until smooth. Add water to get the desired consistency. Stir in the almonds. 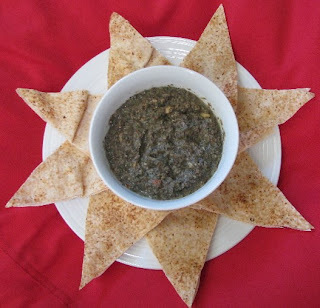 Serve room temperature or chilled with veggies, crackers, or flatbread.